Sticking with my recent hair theme, I've been waiting hard for the blonde highlights I got last summer to grow out so I can go back to being a full-on ginge and possibly even dally with Little Mermaid red again. One of my favourite products when my hair was au naturel was John Frieda's Luminous Colour Glaze from their Radiant Red range. I like playing about with my hair and changing my look, but don't particularly like dyeing it as it's so much glossier when I leave it alone. This red glaze allowed me to feel like I was at least doing something with my hair colour (it doesn't contain peroxide or ammonia however) as it made it noticeably more vibrant, while at the same time boosting shine. Perfect! It was easy to use - just slap it on in the shower after shampooing and conditioning hair and leave it for a few minutes before rinsing out. A few years back I died my hair a very vivid red and this glaze was part of my kit in the battle to maintain vibrancy. So I was in Superdrug at lunchtime yesterday and decided to see if there were any offers on JF, as there often are, and my plan was to stock up on the Radiant Red shampoo, conditioner and of course, my beloved glaze! I drew a blank in the first Boots and after a frantic search in two other branches and a Superdrug, all I was met with was a WALL of JF products for blonde and brown hair in all the stores, but only one had a few dusty bottles of Radiant Red shampoo and conditioner in the corner of the bottom shelf. GREAT. Imagine my utter despair when I got home, hit up Google and found that the glaze has indeed been discontinued! The website still shows the Radiant Red shampoo and conditioner as part of the range, but suggest using the clear glaze if you have red hair. How boring! The red one actually deposited colour - which was the main reason for using the glaze! The blonde version of the glaze is also being discontinued, but I would imagine the clear one will work just fine on blonde hair. JF are continuing to produce the brunette glaze. 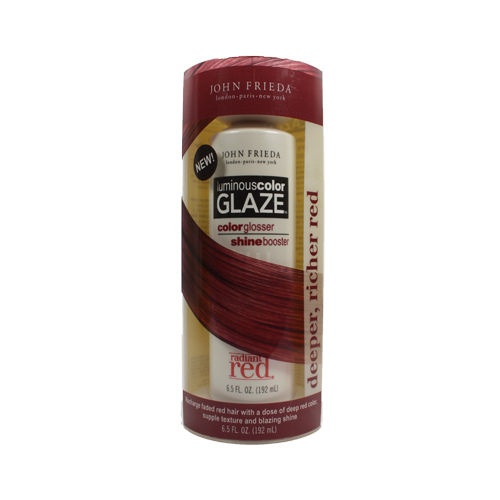 Now JF probably discontinued due to the rarity of redheads - real or fake - compared to other hair colours so the Radiant Red range is probably their least profitable, but at around £7 a bottle it wasn't exactly cheap and they'll lose some loyal customers. While there aren't so many natural gingers, there's tonnes of bottle-reds who I'm sure would catch onto this product if only JF marketed it more aggressively - I don't ever recall seeing an advert about the colour glazes. I'll continue to use the shampoo and conditioner - if I can find it - and hope another company come out with a similar colour-depositing glaze for red hair soon. That's a shame. I would have liked to try it. Us redheads get the slim pickin's when it comes to hair stuff like dye or hair extensions! @Robyn It really was a great product :( I have a few mls left in an ancient bottle which I am conserving for special occasions, but maybe I'll be able to pick up some on eBay. @Angel Let me know how you get on with the Brunette version! @BottledBeauty You're right about the slim pickings, I am thinking of going much redder soon and so I always have a look at the hair dyes whenever I'm in Boots or Superdrug, and they only have a handful of different red shades and a million browns and blondes, but brown is brown as far as I'm concerned!